The annual Cinemalaya Film Festival never failed to capture my interest. While I look forward for the line up of films, I never managed to watch anything yet during the festival dates. What usually happens, I watch the trailers and make a mental note of the films that interest me. Later, I will pray that these films will be aired in Cinema One. One of the films I've been meaning to watch is Mariquina. It joined the festival in 2014 and it was only over the past weeks when I chanced its local airing. 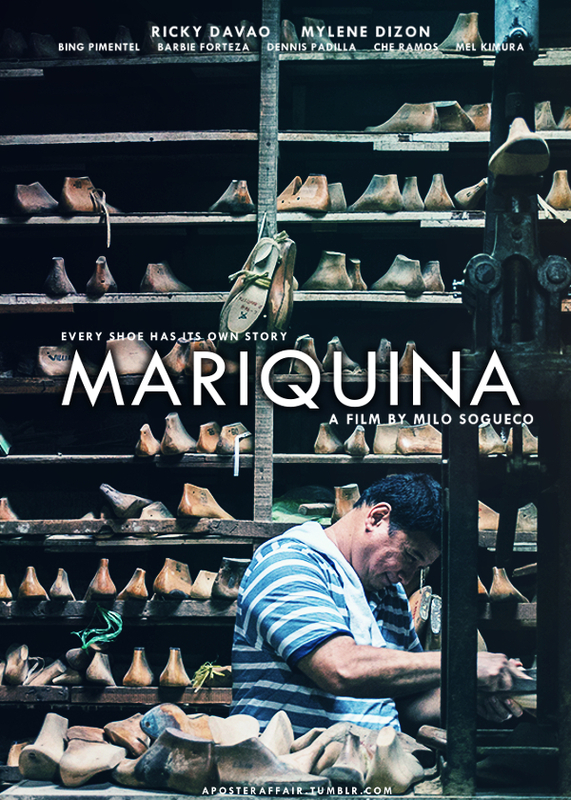 Mariquina relates the story of a shoemaker and his estranged daughter from Marikina. Mariquina is the old name of the city during the Spanish Colonization period. Over time, its name transformed and became Marikina. The film started by depicting a typical Filipino family. Ricky Davao, a father who survives his family from a shoemaking business. He is portrayed as one of the pioneers and best shoemakers of the city. Mylene Dizon then is the supportive, dutiful and obedient daughter of Ricky Davao. What we thought as an ideal family suddenly changed when the family's matriarch left. This was when all the conflicts and turmoils started to happen. The film exhibited a melancholy mood all throughout. It was all about sadness, tragedy and regrets. Despite the heavy and hopeless story, I love the film for many reasons. I admire the personification of Ricky Davao and Mylene Dizon's deteriorating father-daughter relationship to the struggling shoe industry of Marikina. What used to be a perfect family full of love and optimism has devastated. Same goes with what used to be a promising shoe industry in Marikina. I was probably one of the fortunate last generations to witness the flourishing shoe industry of Marikina. Long before cheaper and mass produced goods from China invaded the local economy, Marikina has its own share of growth arising from the shoe industry. I remember the days when every residential street has at least one small scale shoe factory. Owners station their factories in the comfort of their own homes to save on operational costs. Unknown to most Filipinos, the culture of collaboration was very strong among shoe manufacturers in Marikina. Small scale factories share their production projects. I remember a neighbor, who secured a deal to supply for Robinsons Department Stores. Because the owner cannot cope with the heavy volume of production, the production was shared to fellow shoe manufacturers. This has always been the system of shoemakers in Marikina. Shoemakers promote a community of collaboration than competition. I'm not sure if any historical account in Marikina was able to document this rare business culture. Nobody is considered as a competitor. Every fellow shoemaker is as a potential and valuable partner. I was glad that the movie captured this hidden and honorable tradition. Hats off to the team of writers who did an extensive research. A film about Marikina will never be authentic without showcasing popular places that books don't often document. The famous Luyong Restaurant serves as an unwritten component of the city's heritage. I love that all the significant milestones of the family in the film was celebrated in the restaurant. Consider Luyong as Marikina's own version of the best Chinese restaurant in town. The riverbanks, Our Lady of the Abandoned Parish, even the house of the family in the film were all part of Marikina's key landmarks. The film's uncommon story telling approach also went best for me. It started with the ending and later, an entire account of all the events. I highly recommend the film to anyone reading this review, even for the non-Filipinos. The film was overflowing with meaningful themes and personifications about the struggle of the local shoe industry. Definitely, 5 out of 5 stars for Mariquina.